Make a loop trip off of the Cross Vermont Trail around Wells River, Vermont. 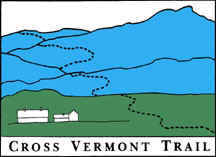 Take the Cross Vermont Trail route through the village, then out along the Wells River including visits to a couple of preserved natural areas. At Boltonville, circle back on scenic town roads, including the historic Bayley-Hazen Road whose construction dates back to the Revolutionary War (maintained more recently).